How To Pay For New Transportation Infrastructure? Congestion Tolling. The good people over at Streetsblog posted a nice piece yesterday on a new poll which suggests that the public favors congestion tolling as a means to pay for new transportation infrastructure. The article yeilds plenty of useful insights, but I am left wondering about who exactly was polled in this study. As a reader commented, it’s pretty clear that the majority of respondents are not public transit riders. 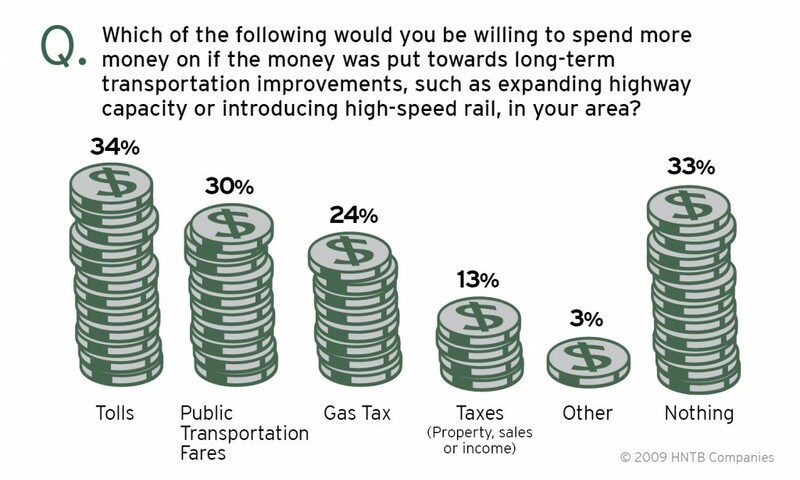 It is certainly signficant that 33% were unwilling to pay anything and that an additional 30% favor raising public transit fares. Sure, the study might help to jumpstart a broader conversation about tolling, but it seems to indicate that we’ve still got a lot of work to do if we want to convince the general public that this is the best direction to head in. The puzzle of how to pay for new federal investments in transportation is the single greatest stumbling block facing members of Congress — should a gas tax increase be combined with a vehicle miles traveled (VMT) tax? How about a national infrastructure bank that leverages private capital?A poll released today by the engineering firm HNTB suggests that higher gas taxes could continue to face political headwinds from both sides of the aisle, even after the recession begins to ease. But the poll found strikingly strong support for tolling, particularly congestion tolling through HOT (high-occupancy toll) lanes. One-third of respondents said HOT lanes should be used for future transportation revenue, with 35 percent supporting the use of public tolling and 20 percent backing private tolls.